When it comes to uniquely awesome ways to be provided with food, I'd be hard put to come up with something more convenient, efficient and pleasurable than sushi train. Surely the only thing that can make eating sushi better than it already is, is having the tasty tid-bits you will soon be enjoying hurtle past you on a "train" track awaiting your gaze and then being snapped up for gobbling down. 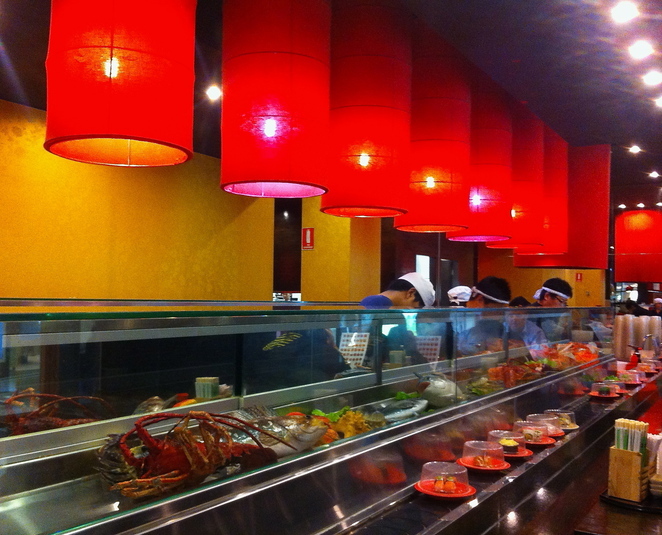 Mitzu Sushi Train and Japanese restaurant is located on the top floor of the Macquarie Centre, in convenient proximity to Event Cinemas. Mitzu has been trucking (or training) along at the centre for quite some time, but in the past few months it has had a menu upgrade, offering a vast array of new and intriguing sushi train morsels. Now, I'm no expert on traditional sushi, but I do hope that with all the copious amounts of sushi I've consumed (which is enough for a lifetime) that I can at least hope to know which sushi is simply delicious. With such variety cruising around the tracks at Mitzu, there's no shortage of a little sushi to suit everyone. If what you desire hasn't been travelling around on any given day however, you can always peruse the menu and have your little something special made to order. A favourite dish of mine isn't actually sushi at all, but there are no rules at sushi train, whatever comes careening around the tracks is up for grabs. The dish I speak of is the chilli chicken. Bite-sized mouthfuls of crispy coated chicken, covered in scrumptious chilli sauce that's not too spicy, but still packs enough of a punch. This one is probably best to order off the menu, just to ensure the chicken is fresh out of the fryer at it's peak of crispiness. Another recent addition to my must-eat list, is the abalone ship. I wasn't too sure how I'd go with abalone, but I took the plunge and am glad I did. The abalone is delicate in flavour with a subtle sweetness that is very satisfying. For the vegetarians among us, there are also many meat-free plates to pick up. One of my favourites is the vegetable fritter with onions, sweet potato and more in a crispy batter. It's sweet from the onions and salty from the batter which has a lovely crunch to it. Mitzu not only succeeds with offering a wide variety of sushi and sashimi to choose from, it is also filled with friendly and efficient staff who are only too willing to accommodate you as quickly as possible. I would recommend taking a little trip down there, catching a movie and hopping aboard the sushi train to see just what is tootling around the tracks. Why? 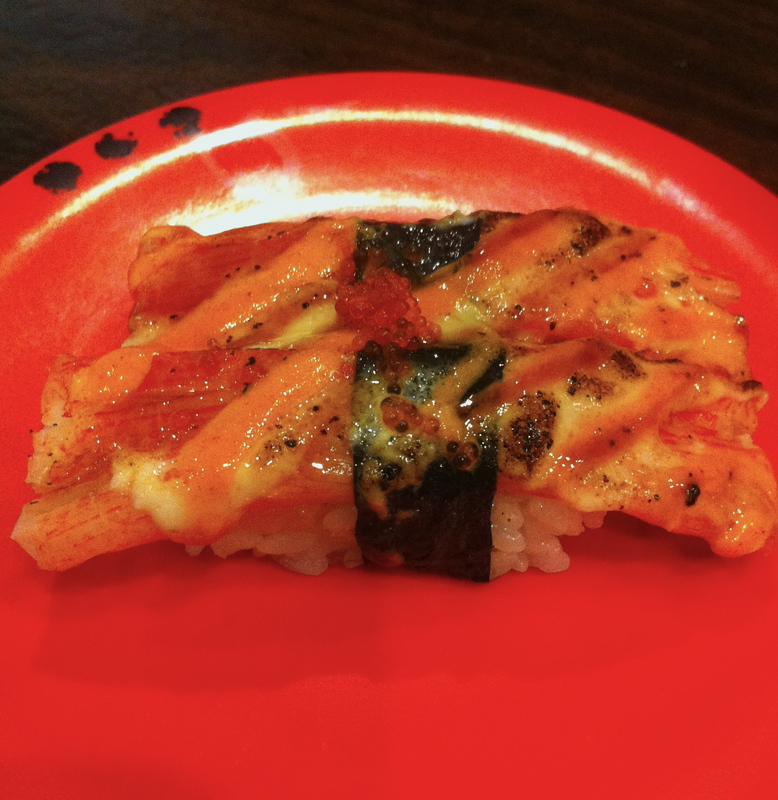 Sushi is delicious and sending it around on a sushi train only makes it better. I've never experienced a sushi train before. How exactly do you and the staff keep tabs on what you're buying, so you know what your bill is going to come to?